Fun, fun, fun!!! This looks great along the bottom edge of a bra top or a tankini top of a 2 piece bathing suit. All you need to do is measure around the edge of the area you are going to attach the beaded fringe, being sure to expand any elastic in the area to its full width so that the ribbon on the fringe can expand with the bathing suit. 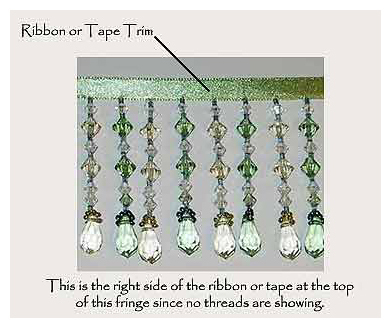 You will probably want to hand stitch the beaded fringe onto the suit so that you can stretch and adjust the bathing suit fabric as necessary to make sure that the ribbon on the beaded fringe is going to move and give with the suit. Stitch the ribbon part of the beaded fringe to the very bottom edge of the suit, making sure that the ribbon on the beaded fringe doesn't show on the right side of the suit.